LISLE, IL. — Chicago Blackhawks center, Andrew Shaw, is scheduled to appear at Bill Kay Chevrolet in Lisle on Thursday March 5, 2015 where he will meet fans and sign autographs. The event will take place between 6:30 p.m. and 8:00 p.m. at the dealership, located at 601 Ogden Ave. in Lisle, Illinois. Source: Bill Kay Chevrolet. 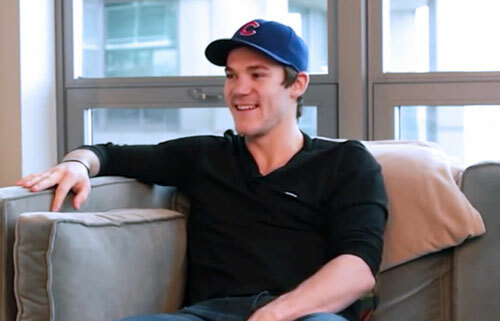 Photo shows Chicago Blackhawks center Andrew Shaw in May 2014 interview. At 4:30 p.m. on the day of the event, the first 200 fans will receive wristbands on a first come, first served basis. These wristbands guarantee the owner to an exclusive Andrew Shaw autograph. Due to time restrictions, Andrew Shaw is only able to provide one autograph per wristband holder, however, fans can use social media for the chance to cut the line as part of Bill Kay Chevy’s #SHAWESOME contest. Participants can link as many submissions as they choose on the Bill Kay Chevrolet #SHAWESOME official contest website. Submissions must be posted by March 2, 2015. Three lucky fans will win a personal meet and greet before the general autograph signing begins. Fans can navigate the current submissions by searching for the #SHAWESOME hashtag on social media. Andrew Shaw currently plays center for the Chicago Blackhawks. He was selected by the Chicago Blackhawks in the 5th round of the 2011 NHL Entry Draft. He helped lead his team to the 2013 NHL championship. Sports Speakers 360 is a booking agent for pro athletes. If you would like to book NHL hockey players like Andrew Shaw for a speaking engagement, autograph signing, product endorsement, fundraiser or special event, contact Andrew Shaw’s booking agent for appearance and speaker fees at Sports Speakers 360. For booking agent and appearance fee information on how to hire Chicago Blackhawks players for appearances, call 1.855.303.5450.